We are currently missing the outer yellow and black channel mark which broke free during the recent heavy winds. An alternative mark will be put in place as soon as possible. Sea area `Abel’ applies to Tasman Bay. Sea area `Stephens’ is usually more applicable to Golden Bay and Farewell Spit. Sea area ‘Grey’ applies to the western side of Farewell Spit. All VHF radio users should monitor Channel 16 and hold an operator’s certificate. Contact Coastguard Boating Education for training or to register a callsign. Users of Nelson Marine Radio’s repeater channels 28 and 60 should subscribe, email: nelson.marine.radio@gmail.com. After making contact, boats wishing to converse should change to a working frequency. Channel 6 or 8 are suitable. 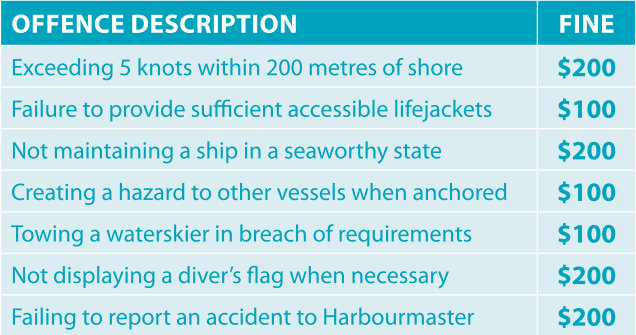 All boats must have suitable buoyancy aids, immediately accessible, for each person on board. These must be worn when being towed, crossing a bar or in adverse conditions such as rough seas, and should be worn in dinghies, kayaks and other vessels prone to capsize. Your speed must not exceed 5 knots (9kph) • within 200 metres of the shore, any structure, or a diver’s blue and white flag • within 50 metres of any other vessel or any person in the water Unless using a designated access lane or reserved area for its intended purpose, or • if anyone is bow-riding or is leaning over the side As a guideline, 50 metres is half a length of a rugby field and 200 metres is two rugby fields. People in the water are at most risk from speeding boats, skiers and jet skiers. Remember, when there is no speed limit, skippers must ensure their boat’s wake does not create a risk and that they travel at a speed which is safe for the conditions. Note that 3 knot limits apply at the two commonly used anchorages, at The Anchorage and beside Adele Island, and adjacent to the marina at Port Motueka. In these areas you should trim and adjust speed for no appreciable wake. Even if beyond the 200 metre distance from shore you must be aware of the size of wake your vessel is generating when underway and alter speed and trim accordingly so that your wake doesn’t cause a danger or nuisance to others. No one under the age of 15 may operate a craft capable of exceeding 10 knots (unless they have an exemption in writing from the Harbourmaster or Director of Maritime Safety) unless under direct supervision. All vessels are required to comply with the marine pollution regulations. This prohibits the discharge of untreated sewage (particulate waste) within 500 metres of shore or a marine farm, 200 metres of a marine reserve, or in water less than 5 metres deep. This effectively prohibits discharge of untreated sewage within Astrolabe Roadstead, or in the greater Torrent Bay. Urine is acceptable. It is also illegal to discharge plastics or oils into the water. All oil spills must by law be reported immediately to the Council’s Regional On-Scene Commander or to Maritime New Zealand. Please retain all rubbish aboard for proper disposal ashore. Divers and snorkellers are vulnerable to propellors and speeding boats. Keep well clear of likely diving locations like rocky headlands or anchored boats when travelling at speed. If you see a divers’ flag, reduce speed to dead slow within 200m, and keep a sharp watch for bubbles or people in the water. When diving from a boat, both the skipper and the divers are responsible for ensuring any approaching boat can clearly see your dive flag from at least 200m away. The flag must be over 600mm along it’s shortest edge. The boatman should wave it if needed, and keep the boat between the divers and any approaching boat where possible . The Maritime Rules and Navigation Safety Bylaws apply to all small craft, including kayaks. Kayakers are encouraged to travel close to shore. 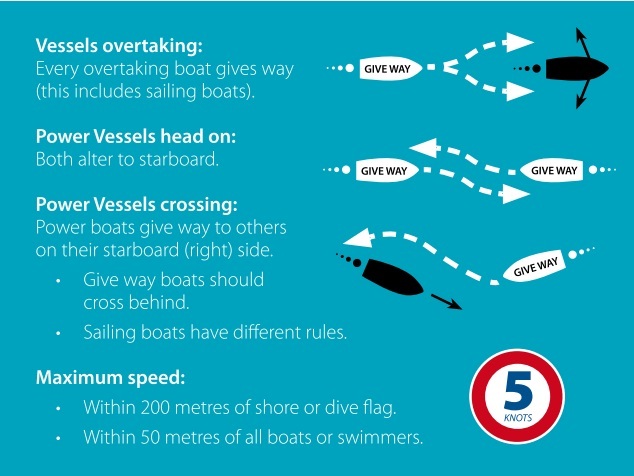 Within 200 metres of shore other vessels are prohibited from travelling at speeds greater than 5 knots (except in water ski areas or access lanes), and you see more. Small paddle craft can be hard to see and usually do not show on a boat’s radar. Kayaks and other similar small craft are encouraged to follow Maritime NZ guidelines and to display a brightly coloured flag or ensure that paddle blades are brightly coloured to aid visibility. For the same reason, kayaks should be finished in a colour that contrasts with the marine environment. You are not permitted to operate a kayak after sunset or before sunrise unless you have appropriate navigation lights. When water ski lanes or areas are in use for waterskiing, other craft, including kayaks, may not enter the area. Please either wait until the ski area or lane is not occupied before proceeding quickly across it, or pass around the outside of the area at least 200 metres from shore. Do not kayak alone unless suitably equipped and experienced. Always wear a lifejacket and carry two effective means of communication. Be aware that the favourable conditions usually enjoyed in this region over summer can rapidly change. Do not paddle in rough or windy conditions and ensure you have the right clothing to keep warm, and don’t kayak alone if you don’t have the skills or equipment to bail and re-enter after a capsize. Sit-on-top kayaks should not be used when the wind is blowing offshore. Try the on-line kayak safety module at www.cbes.org.nz. • Always keep a good lookout and travel at a safe speed. • Powerboats give way to sailing vessels and rowed or paddled vessels (e.g. kayaks). • In general, alter course to starboard (right) to avoid other vessels and keep a 50 metre buffer zone. • When on converging courses the vessel looking at the port (left side and red light) of the other vessel gives way. Best action is to alter course to starboard and pass behind the right of way (stand on) vessel. Stop if necessary. The budgeted and programmed retirement of the outmoded and in some cases derelict leading transit beacons at Mapua, Riwaka, Waitapu and Collingwood is underway, and is likely to be undertaken over the next two months. Also, a replacement floating pontoon for public use at the Mapua wharf will be installed in late May or June. Aids to Navigation more suited to the small craft that predominantly use these areas with their tidal and changeable approaches will be installed at about the same time. Lit and unlit channel marks will be installed at Mapua and Collingwood, and a lit fairway buoy to guide approach to the existing informal markers at Riwaka. A fairway buoy will also be placed off the Motueka River delta in response to recent groundings there. There is no intention to install formal aids to navigation for the defunct port at Waitapu, but unlit buoys may be considered for the benefit of local users if budget allows, once the other locations are complete. The leading beacons at Waitapu have been unlit for several years, and no reports were received when the topmark fell off one last year, so there does not appear to be the demand to justify any replacement. The Motueka fairway buoy that is at the end of its life will be replaced. Any other improvements to navigation marks at Motueka will be deferred until the groyne has been removed and the approaches have stabilised, and will depend on budget at that time. Boaties are expected to carry the largest scale, up to date charts of the areas they navigate, and will be informed about changes to charts via the official Notices to Mariners, issued by Land Information New Zealand. Subscription to these notices is free at www.linz.govt.nz/hydro/ntms. Updated signage will also be erected in due course at ramps as required. If you have any questions about these projects, please contact Selwyn Steedman, Transportation Network Engineer, at the Council’s Richmond office. The approach to Port Motueka involves a sandbar that is subject to frequent change. It is recommended that recent local knowledge be sought before crossing the bar. Use a depth sounder in this area and travel at a safe speed at all times. In general the bar should be attempted near the top of a rising tide if you are not familiar with the best route. Observe the bar conditions for a reasonable period from offshore. In general, the most dangerous conditions occur in the last four hours of a falling tide if the wind is onshore. If it looks unsafe or beyond your skills and experience it is safer to wait offshore for conditions to improve or divert to another landing place. Lifejackets must be worn by all persons on all vessels, by law, when crossing the bar. The Motueka Port Users Group has installed a black mussel float with a radar reflector, and several yellow buoys with black diagonal stripes. These should not be relied upon for navigation as their positions are subject to change, but they provide a useful guide to the outer channel. They should be held on your starboard (right hand) side when entering from the sea, and about a chain (approximately 20m) off your port (left hand) side when leaving the harbour. The image below shows an informal plan based on a November 2011 survey of the channel. Note that depths and positions of shoals and buoys are subject to change at any time. You must report any unintentional grounding or other mishap as soon as practicable to Maritime New Zealand on VHF Channel 16 or by calling 0508 225522, and the Tasman District Council Harbourmaster on 03 543 8400. Regular users are encouraged to join a local club for ramp access. Casual users of the Motueka Power Boat Club marina ramp should contact the Talleys gatehouse for a temporary card. The ramp fee is $10 and a $20 card bond is payable (fees subject to change).